[WILLEM IV, Prince of Orange]. [WILLEM IV, Prince of Orange]. [4 elegies on the death of Willem IV, Prince of Orange]. (1) MEIJER, Jan. Billyke traanen, uitgestort op het overlyden van zyne doorluchtigste hoogheid Wilhem Carel Hendrik Friso. Amsterdam, Theodorus Crajenschot, 1751. 1mo broadside (53 x 39 cm). (2) OMMERING, Adriaan van. Op het schielyk afsterven van zyne doorluchtige hoogheid Willem Carel Hendrik Friso. Amsterdam, Andries & Jacobus Stanhoffius, 1751. 1mo broadside (49 x 33 cm). (3) KLOEKHOF, Cornelis Albertus. Treurzang op het afsterven van syne doorlugtigste hoogheyd Willem Carel Hendrik Friso. Utrecht, Nicolaas van Vucht, 1751. 1mo broadside (52.5 x 39 cm). (4) Op het allersmartelykste en voor den lande allerdroevigst afsterven van zyne doorluchtige hoogheid Willem Carel Hendrik Friso. Amsterdam, Antoni Waldorp, . 1mo broadside (52 x 38 cm). 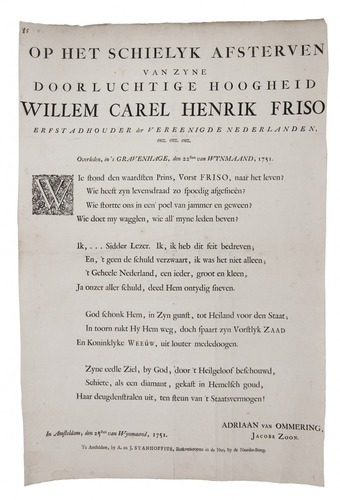 Collection of 4 extremely rare broadsides with elegies on the death of Willem IV (Willem Karel Hendrik Friso), Prince of Orange (1711-1751), the first hereditary stadtholder of the Netherlands. At least three of the four were reprinted a year later in Dichtkundige cypressenbladen, a collection of elegies on the death of Willem IV. Ad 1: Second copy located of an elegy by the poet Jan Meijer, who wrote several occasional poems under the motto "omnia conando, docilis solertia vincit", including an earlier poem welcoming the Prince into the city of Amsterdam (Onverwagte welkomst-begroetinge aan W.C.H. Friso uit naam der burgeren van Amsterdam). The main poem in the present broadside consists of 7 verses, the first of 6 lines and the rest of 8 lines, and is followed by another 4-line poem at the foot. Ad 2: Second copy located of an elegiac sonnet by the poet Adriaan van Ommering, who openly accused himself of murdering William IV in the line "Ik, ... sidder lezer. Ik, ik heb dit feit bedreven" (I, ... tremble reader. I, I have committed this deed). Ad 3: Only copy located of an elegy by the physician and later burgomaster of Culemborg, Cornelis Albertus Kloekhof, consistsing of 14 verses of 6 lines. Ad 4: Only copy located of an elegiac sonnet by an anonymous poet, written under the motto "ante monet beatitas". These rare, large broadsides, each printed on a large whole sheet of paper (1mo) are also of typographic interest, in part because they use large initials and types that are not so often used for books aside from occasional heading in large types. All in very good condition, especially considering the ephemeral nature of these publications, with only the ends of a few old folds reinforced. Ad 2 is trimmed close to the outermost edges of the widest line of type at left and right, but they otherwise have generous margins. Rare broadsides on the death of the Prince of Orange. Ad 1: WorldCat (1 copy); not in Knuttel; Picarta; for the author: V.d. Aa XXII, p. 791; ad 2: V.d. Aa, Nederlandsche Dichters III, pp. 12-13; Knuttel 18332; WorldCat (1 copy); not in Picarta; ad 3: not in Knuttel; Picarta; WorldCat; for the author: V.d. Aa X, pp. 240-241; ad 4: not in Knuttel; Picarta; WorldCat.